Some books are able to put you in the shoes of their protagonist, however different this character might ever feel from you. They make you see the world from their eyes, experience life from their point of view, and ultimately show you that we all share the same few fundamental needs. The Geography of Pluto is one of these books. With this novel I spent a day and a half – that’s how fast I devoured it – beside Will Ambrose, a gay man reaching his 30’s, the partygoer I won’t ever be, and shared with him the pain of a failed relationship, the terror of impermanence and the crave for love. How can you lose something you thought was forever? The premise of The Geography of Pluto is simple: Will and Max were together until recently, when the latter abruptly ended their relationship with a few words of painful honesty that should have open Will’s eyes but only threw him into denial. Will is shattered. He goes from incredulity to anger, from cold and recoiled depression to deluded hope of getting Max back. During this time, Will somewhat re-invents Max and forges memories of an idealized relationship that has little to do with reality. The rejection and sudden loneliness created the illusion that his former boyfriend used to provide everything that Will is needing now. My current state had erased and rewritten his [Max’s] character flaws and turned them into poetic mannerisms for me to mourn. Actually, Will seems trapped in some limbo similar to grief: stunned by the sudden loss of someone close to his heart and angst by the unjust pain it causes him. Shooed away from the path he had planned to follow, he’s left lost and confused: “What do I do now?”, “Where do I go?”. Worst, his memories – real or fake – become a jail: Will focuses more on what he has lost and this clinging prevents him from going ahead. I had thought I was getting better, but I had underestimated Max’s power. And when I closed my eyes I could still feel his gravitational pull across time and space, holding me within his orbit. An unspoken truth that would weigh upon her until she was ready to confront it: that she was the mother of a gay man. However, Will’s mother will also push him to learn and grow up. When her life is threatened with cancer, Will suddenly makes giant steps as an individual. He conjures the strength to tell her he’s gay, feeling that she must know him and he must dare coming out before it’s too late. Furthermore, it makes Will sense the pressure and unavoidability of impermanence. Sickness makes you feel powerless: it threatens and sometimes take away your loved ones, force on you a terrible loss that you can’t do anything about. Loss, grief, mourning, The Geography of Pluto explores the emotional pain of separation with a simple story and beautiful writing. It brought me so close to Will, makes his experience so vivid to me, that I forgot several times that this novel was a fiction. 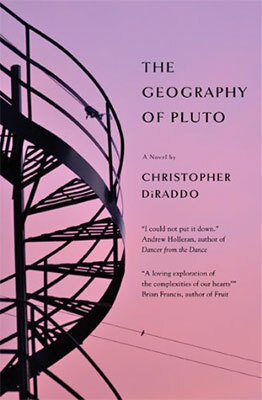 Will Ambrose feels so real, so ordinary, and his struggles so terribly familiar, that everyone will recognize a bit of himself in The Geography of Pluto. I can’t recommend this book enough.